The irony of the G8 lies in its location. Gleneagles. Truly a playground for the rich and famous, with its expansive golf courses, stunning views over Perthshire hills and Michelin-starred restaurant. I can picture the eight world leaders discussing world poverty and African debt over cream tea and cakes. The main worry for many is how much the summit is going to cost. The estimated number of millions seems to spiral as the days go on. Shouldn't the money be used to help fund the summit policies: preventing climate change, or countering terrorism? But much is being spent on policing the event, which is very reasonable. At least I know my house is unlikely to be burgled. 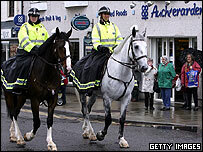 Most of Scotland's police officers will be surrounding Gleneagles next month, in preparation for the protesters. Yes, the protesters. Thousands of them, apparently. The thought of my little town being swarmed by all these people is quite laughable when I see the quiet streets today. Where will they all go? I hope these protesters know what they are letting themselves in for. If the security is as promised they aren't going to get near Gleneagles and Auchterarder isn't the most exciting place to spend your summer. We have been promised that our lives will not be affected at all, in fact we will not even know it it happening. G8? What G8? But I am missing the entire event anyway. Just before the 6th, I am heading 20 miles south to camp out at my gran's before leaving for a holiday on the 7th. My family decided that we didn't particularly want to be around if things got messy. It is quite exciting, I suppose. No longer can we complain of nothing ever happening here. 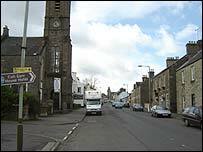 Auchterarder has been spectacularly propelled into the public eye in recent weeks. "Not the most exciting of places to spend the summer"
The previously run-of-the-mill walk home from school each afternoon has become a minefield of media, with everyone from primary children to OAPs becoming expert in avoiding being photographed, filmed or interviewed for the radio. Bad hair days cannot be risked. This is not all. Just last week, we were visited at school by the mounted police. They looked very impressive, trotting up and down the playground. Seeing local faces on the news also provides entertainment. I have mixed feelings towards the G8. 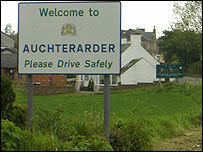 In some ways it seems farcical to have Auchterarder on display to all the world, for all the wrong reasons. On the other hand, some big decisions could be made that could make 2005 a year to go down in history. All we can do is cross our fingers and put our faith in eight men.